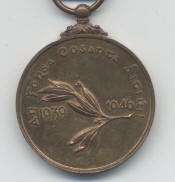 This medal series was instituted on the 6th October 1944 but was not issued until after the cessation of hostilities when production and issue commenced in 1947. The series has a common obverse but eleven different reverses and two ribbon types. The obverse shows a female figure representing Eire , left facing in a flowing robe and cloak. She is straining a wolfhound with her left hand and her right hand holds a long sword facing downward. 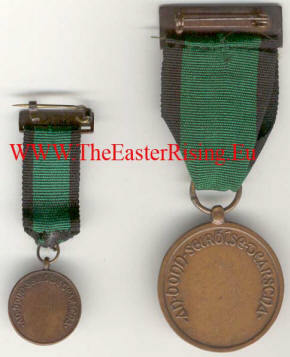 above and around her is the inscription "RE NA PRAINNE" translated as " Emergency Period"
The image below shows an example of both ribbon types, the common obverse and the suspension pin with the words "SEIRBHIS NIASUNTA" , national service. 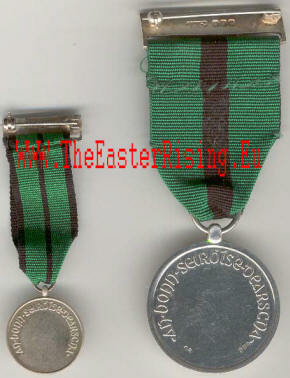 A bars shown were added for each additional two years service, they have the dates 1939-1946 on either end of their front. 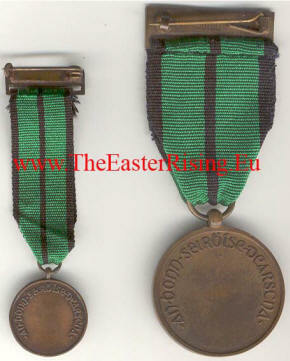 Information Courtesy of Eamon O'Toole "Medals of the Republic of Ireland"
AN SLUA MUIRI : the Maritime Inscription which was also part of the second line reserve. 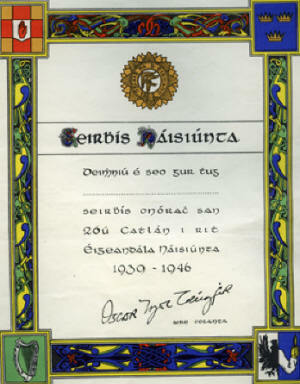 SEIRBHIS ALTRANAIS AN AIRM : the Army Nursing Service founded in 1922 at the formation of the state , this was one of the smallest units of the defence forces. This is the second rarest of the series. AN SEIRBHIS SEIPLINEACHTA : the Chaplaincy Service issued to the small number of uniformed clergy and some civilian officiating chaplains. The rarest of the medals. NA SEIRBHISE REAMHCURAIM IN AGHAIDH AER-RUATHAR : the Air Raid Precautions Organisation A civilian passive defence , rescue warden and fire service established in 1943. NA CAOMNOIRI AITIULA : the Local Security Forces (regional police and security services) This had about 148,000 members at its peak. Unnamed Emergency Service Certificate 1939 - 1946 issued for a member of the 26th Battalion. 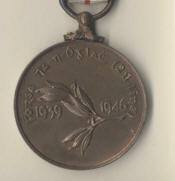 This medal was similar to the Emergency series above in that it was instituted on the 6th October 1944 but was not issued until after the cessation of hostilities. 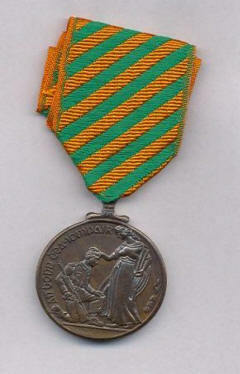 Its obverse is as above while its reverse shows a steamship at sea with a sailing ship just visible beyond its bow. 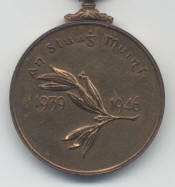 Inscribed above is "AN TSEIRBIS MUIR-TRACTALA" translated as The Merchant Marine Service. 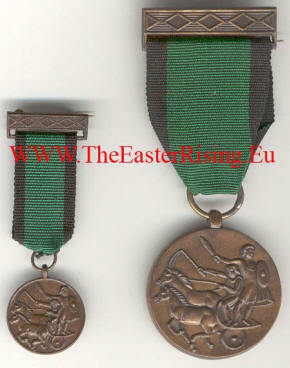 Two examples of the service medal are shown the left hand side being a ten year service with St. Patrick blue ribbon while the right hand side being a fifteen year service ribbon with a gold stripe in the centre and a bar for the extra 5 years service. 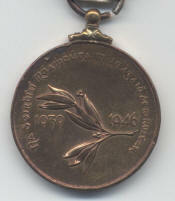 This medal instituted in 1987 was first presented in 1989. It would be ranked after the Permanent defence forces above but lower than the DSM below. 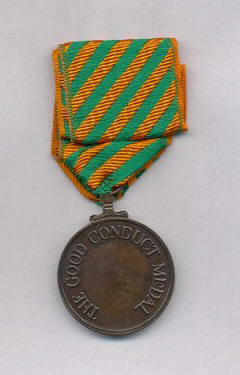 This medal was awarded for meritorious service characterized by exemplary conduct of an individual NCO or private solider. 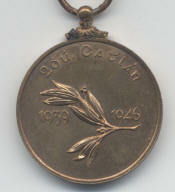 This medal introduced in 1944 was awarded for acts of gallantry or bravery arising out of or associated with military service and involving risks to life and limb above and beyond the call of duty. 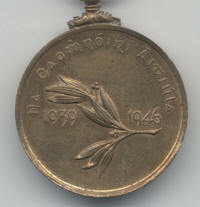 Military Medal for gallantry 1st Class or Military Medal for Gallantry "with Honor", cast in silver. 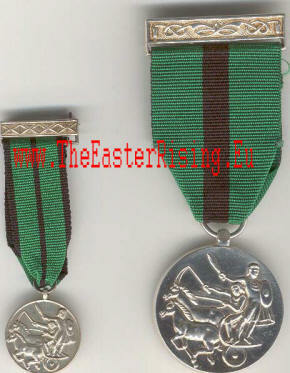 Military Medal for gallantry 2nd Class or Military Medal for Gallantry "with Distinction", cast in bonze. 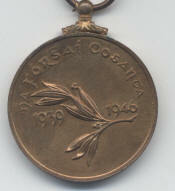 Military Medal for gallantry 3rd Class or Military Medal for Gallantry "with Merit" , cast in bonze. 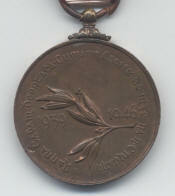 This medal was awarded in recognition of individual or associated acts of gallantry, courage, leadership, resource or devotion to duty arising out of or services in the defence forces not meriting the award of the MMG. 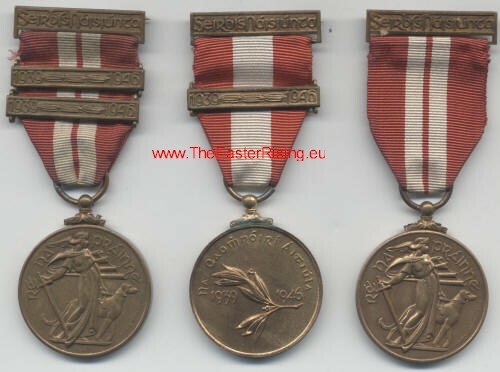 The Distinguished Service Medal 1st Class or The Distinguished Service Medal with Honor, cast in silver. 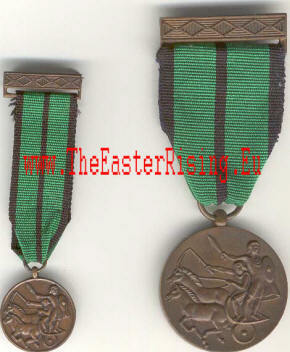 The Distinguished Service Medal 2nd Class or The Distinguished Service Medal with Distinction, cast in bronze. 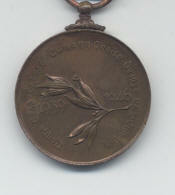 The Distinguished Service Medal 3rd Class or The Distinguished Service Medal with Merit, cast in bronze.